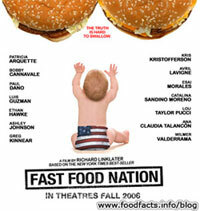 The film Fast Food Nation is due to be released in the US in October of this year. The movie is based on Eric Schlosser's book Fast Food Nation, a scathing indictment of the fast food industry. The film's directer, Richard Linklater, has taken Schlosser's non-fiction tome and turned it into a drama with a star-studded cast including: Greg Kinnear, Patricia Arquette, Ethan Hawke, Kris Kristofferson, Avril Lavigne, and Bruce Willis. I've put together a Fast Food Nation, the movie, information page that I'll keep updated with more detailed information on the film. The page also include the film's official trailer and other videos from the film.